OVER 200 PAGES OF INFORMATION AND VIDEOS TO HELP YOU NAVIGATE THE WORLD OF PIANOS. RENT AN UPRIGHT OR GRAND PIANO FROM £45 a month. If you pay 10 months’ rental in advance the full amount will be deducted from this or any other piano. For more details please see our rentals page. We have a good stock of Steinway, Bechstein, Blüthner, Wlemar, Knight, Feurich, Kawai and Yamaha pianos. With over 70 upright and 15 grand pianos, we have a great variety of stock – new, restored German and English and Japanese ranging from £900 to £32,000. All have well regulated touch and are finely voiced. For all our pianos for sale please see our stocklist which is regularly updated. Rental only: 3% of purchase price per month. Rent to buy: 5% of purchase price per month. Most unprofessional: I've e-mailed this company with the information requested on the 10th of December 2018. I've called a few weeks later and was told that they will get back to me in the New Year. Then called again in January to chase but only empty promises that they will get back to me. On Monday the 4th of March I called again and finally got some help telephonically with the promise that my case will now be dealt with. On Wed the 6th of March I've received a text message: "Yes, I'm out tuning today away from the office but will check e-mails again tomorrow and get a reply to you then I hope. I had no communication once again... I was hoping that Clive just forgot and sent him a polite request yesterday to get back to me. And then his response: Like I said...I will but there are other customers too and I deal with them in order of priority. The more messages I get the longer it takes." You as reader can certainly make up your own mind what to think of this response. I really hope to get an apology from whoever cares about this company/business. No potential client should be treated like this. I had been looking for a piano for some time when I found one of Markus' videos on the web. I was so much convinced by his professionalism that I went on their website to find one of the pianos he introduced in one of his videos and after one week I'm sitting here listening to my daughter playing the piano. They are such a nice, helpful and professional team that I can really recommend them to anyone who seriously wants to buy a quality piano. I thank them for this wonderful buying experience. Imagine playing grand pianos by Bechstein (x2), Bluthner (x2), Bosendorfer (x2), Lipp, Ibach and Steinway all in a Saturday afternoon - well you can with the excellent selection at with either the retail shop or workshop. Bechstien Model IIII & 8 and Grotrian -Steinweg uprights tried too - which was the reason for our visit! Technical expertise, passion for the piano and outstanding customer service - we have enjoyed these in equal excellent measure in our purchase of a “new” 1919 grand piano from Roberts Pianos. Marcus Roberts helped us to find a wonderful piano perfect for us now and that will last us generations; he guided us on the priorities for its restoration, whilst fitting within our budget; we are delighted with the result. We have had the piano for a month now - delivery and aftercare have been faultless too. Thank you for helping us find our piano. As a pianist and teacher I was looking in 2005 for a concert instrument to be housed in our local church, for recitals. Marcus Roberts very helpfully found a Yamaha C5 Grand and more recently, in 2014, when I needed to update my (smaller) teaching piano, I went back to Roberts Pianos and Marcus recommended a Kawai 4'11'' grand which, like the Yamaha, is proving to be a beautifully-toned and balanced instrument. I have been delighted with the helpfulness of all the staff, including the efficiency of the removal operation. We moved to Oxford last August for a one-year assignment. As we have two young children who play piano, one of the first things we did after settling in was to look for a shop with piano rental service. 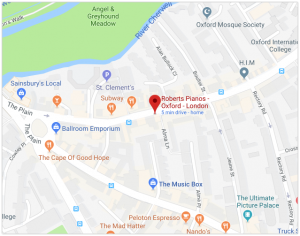 A friend who has lived in Headington for years recommended Roberts Pianos at St Clements Street. We were greeted by friendly staff the second we walked in. Marcus Roberts’ son Evan professionally guided us to try many different pianos in the showrooms and workshops. Throughout the process he and his co-workers were very helpful, courteous, patient, and knowledgeable. Evan later introduced us to Marcus, who showed our children around and encouraged them to try out different models. We eventually settled on a Welmar Fine English upright piano, which has an elegant look and beautiful sound. We rented it for 11 months. Marcus was very kind to offer that if we need to use the piano for additional weeks beyond the rental period, he is “absolutely fine”! The delivery team was polite and efficient. Our children have thoroughly enjoyed playing the piano over the past 11 months. Looking back, we are very happy with our decision of choosing Roberts Pianos. We would recommend them to anyone looking for a great piano and great service. The Roberts family have been in the trade for four generations, starting in 1919 with David Roberts who worked as a piano and organ tuner and restorer in the Exeter area. David’s son Brian helped with piano restoration but went into music teaching. His son Marcus started as a teacher but began piano tuning and restoration in 1980. After five years tuning and restoring, with clients including Vladimir Ashkenazy, John Lill and Alfred Brendel, he took up piano dealing in 1985. His sons Stephen and Evan are now all working with the Roberts Pianos team, which comprises of about 8 full-time workers. We currently serve top concert venues in Oxford, London and Portsmouth with clients such as Oxford University, Portsmouth Guildhall, Wembley Arena, Eton College, Radiohead, Jamie Cullum and Adele. We specialise in top quality grand and upright pianos with sales across the South of England from Cornwall to East Anglia.